One is office size, suitable for small groups only (six-eight people – see picture below). Our main room is large enough for at least thirty people and has a variety of seating options. 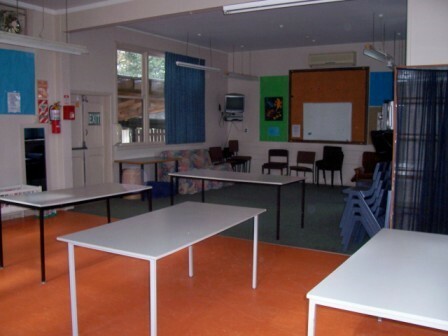 Trestle tables are available or the floor can be cleared to form an open space. Our kitchen has tea & coffee making facilities, sink, fridge, microwave, bench top oven and water cooler. 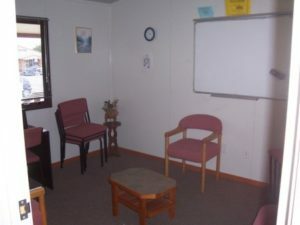 Both rooms have a white-board (picture below shows main room). The third room is our corner building situated on our old site at 216 HBC Highway. 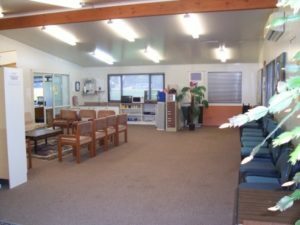 It has a kitchen, air conditioning, play area and plenty of shade. There are tables and chairs for thirty or more, including some child-sized ones. (See photo below). Our rates start at $8.00 per hour for community groups and $16.00 per hour for other hirers. Our all day booking rate is $45.00/$90.00 as applicable. There is parking available on both sites. All our rooms now have disabled access. Our new site has toilet facilities for disabled users also. We will negotiate with regular users. Contact us. We now have a defibrillator on site to help in emergencies if anyone collapses or has sudden heart problems. This was funded by a grant from Lion Foundation. We hope that we never have occasion to use it but are prepared if an emergency arises!